Problem: My CC3D stopped working. Details: The board kept rebooting. After connecting the USB cable Windows was making a “ping” noise telling the device was connected and then “pong” that is was disconnected. Cause: Unknown. I was playing with telemetry and gimbal stabilisation and something must have gone wrong with configuration. This should not happen but it did. Solution: open OpenPilot GCS and go to Firmware tab. 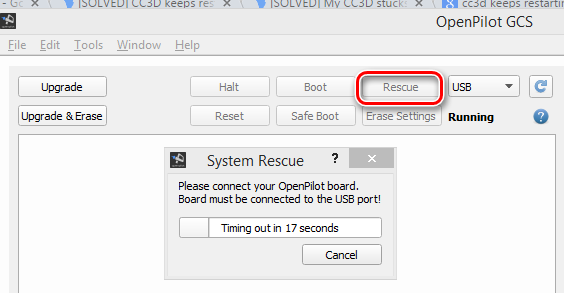 Then click “Rescue” button and plug in the USB cable. You have 20 seconds to do so. The board is not halted before bootloader completed. Now click “Erase Configuration”, which will wipe out the settings that cause reboot loop. Boot normally, reload the last working configuration and you are done!